This year, the Charity Fund “Nova Hromada”, created by New Products Group, will celebrate its 5th anniversary. Throughout the time of the Fund’s existence, its leadership and volunteers have prioritized helping those in distress, focusing on social issues and actively participating in the public life of the country. The efforts made by all of those involved in the fund’s activities have already been awarded many times, including at the state level. 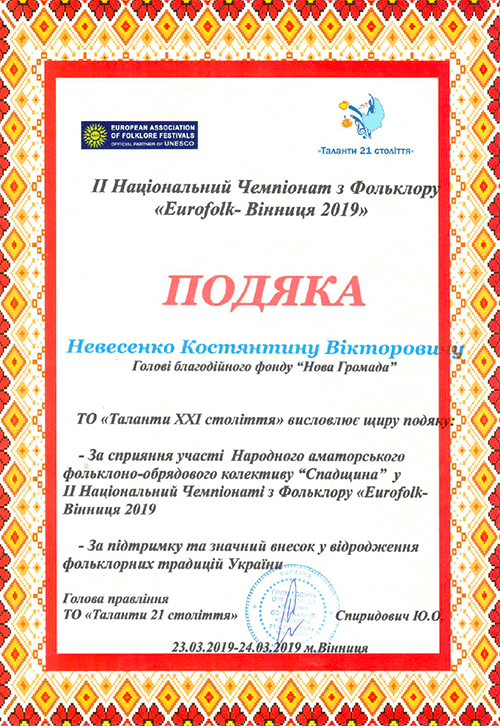 And now, once again, the representatives of “Nova Hromada” have something to be proud of: the good deeds of the fund and, in particular, its head Kostyantyn Nevesenko were marked by four recognitions. At the end of 2018, words of gratitude were expressed to Kostyantyn Viktorovich by Kuzma Atamanov, the acting head of the Starohnavivka village administration, which is in the Volnovakha district of the Donetsk region. The community leader thanked the head of “Nova Hromada” on behalf of all his fellow villagers for helping the community, mainly the children. For almost five years now they have been living on the demarcation line with the zone of hostilities in eastern Ukraine, and have seen and felt all the horrors of war. Every family, and especially families with children, needs material and moral support, and the fund’s representatives readily offer their support to these courageous people. “Your good deeds warm up our hearts. May God thank you for this with mercy, peace and clear skies above your head”, wrote Kuzma Atamanov in his message of gratitude to Kostyantyn Nevesenko. Since the start of the hostilities, the CF “Nova Hromada” has been sending assistance not only to the civilians living near the front, but also to our protectors. At the height of the war, the fund transferred military equipment, including armoured cars, body armour, thermal imagery, night vision goggles, food, and allocated money for the treatment of the wounded. The support of the military, both for those who are now in the area of the Operation of the United Forces and for the veterans, as well as their families and the families of the fallen soldiers, continues. This fund was thanked by many, including the Committee of Military Chaplains – members of the ATO under the Association of Independent Orthodox Communities (signed by the head of the Association of Mykola Blazinsky) and the Special Unit of the Ukrainian Chaplaincy of the village of Chermalyk, Volnovakha district of the Donetsk region (signed by Ye. Kovalenko, Head of the Unit). 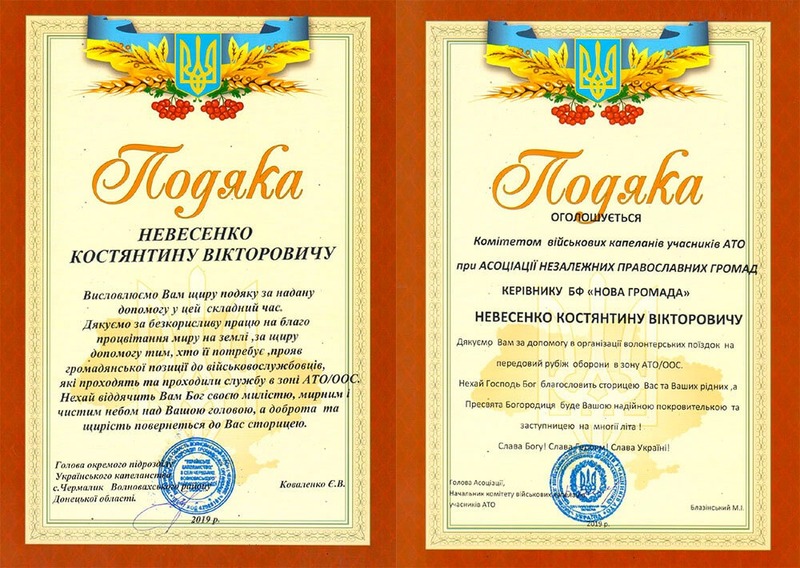 Both letters were presented to the head of “Nova Hromada” Kostyantyn Nevesenko in early 2019. 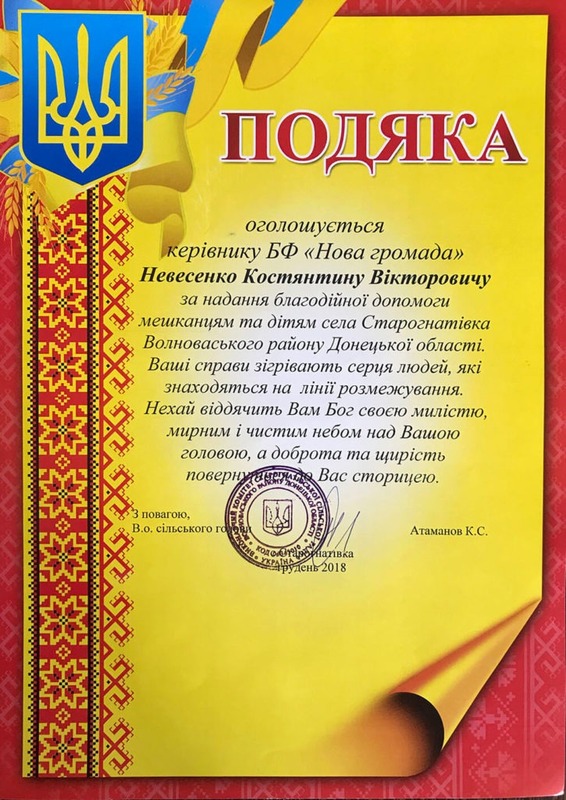 And in March of this year, Kostyantyn Viktorovych received another, no less important, award: thanks from the Creative Association “Talents of the 21st Century”, the organizer of the Second National Folklore Championship “Eurofolk-Vinnytsia – 2019”, which is held jointly with the European Association of Folklore Festivals, an official partner of UNESCO. Yuriy Spiridovych, the Chairman of the Board of “Talents of the 21st Century”, noted the contribution of the leader of “Nova Hromada” to the revival of folk traditions in Ukraine and thanked for his support of the folklore group “Heritage” from Zhashkiv, who competed in the championship. “Such appreciation of our work is extremely gratifying to me as the director and to all our volunteers. Of course, we do good deeds not to receive accolades, but sincere appreciation from people is evidence that our efforts are effective, that we have chosen the right direction, and that what we are doing really makes a difference in people’s lives, and represents life-saving help and support. We strive to be with our compatriots in times of joy and in times of distress, because only by uniting and supporting each other we can overcome difficulties and move forward”, commented Kostyantyn Nevsenko on the awards.